Garvin Thomas is a “one man show”: photographer, reporter, writer and news anchor. 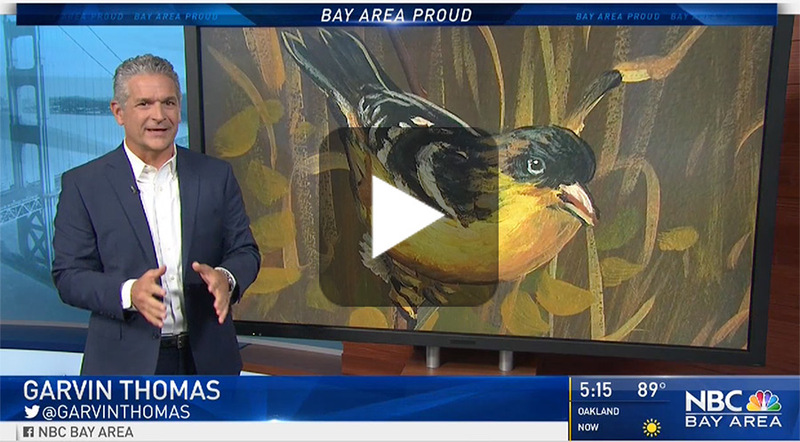 He has put together and presented over 500 stories about inspiring people in the Bay Area for NBC. It might make production complicated, but Garvin could certainly be the subject of one of his own segments. I collaborated with photographer Ray Rychnovsky on the Stoneridge project and we enjoyed getting “mic’d up” and spending an afternoon sharing the joy of our small project with Garvin. 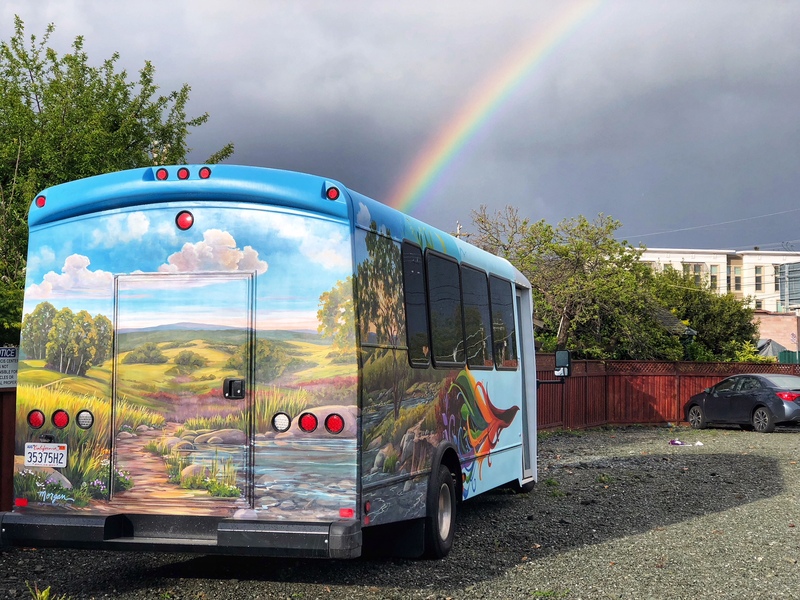 Stoneridge Creek found out about me through the Kickstarter campaign I put together back in January to fund painting a mural on a bus for the St Francis Siena Youth Center in Redwood City. Remember the bus project? One of the donors on that campaing also happened to be one of the owners at Stoneridge Creek Senior Living Community. 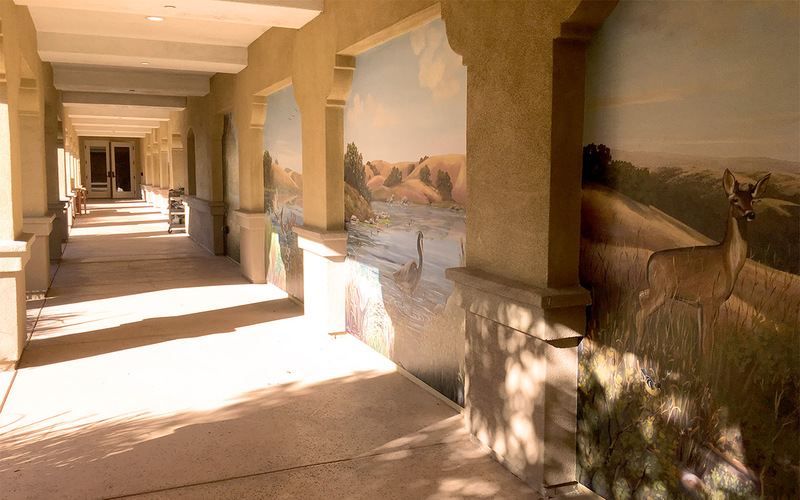 He had the (fabulous) idea that mural art would be a great addition to the bare walls along this long, outdoor corridor that links residential apartments to the main clubhouse. 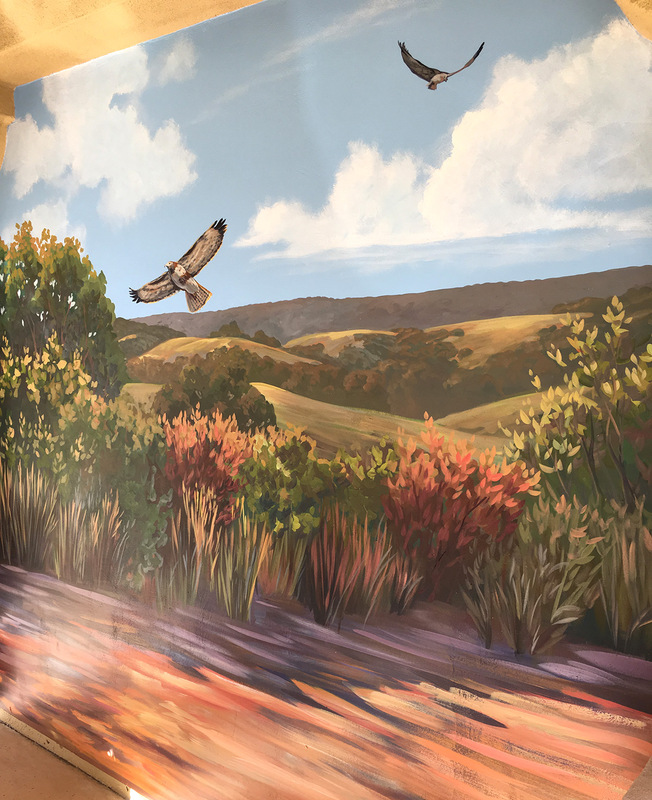 The design was for a series of nine landscape murals that celebrated the local nature preserves. 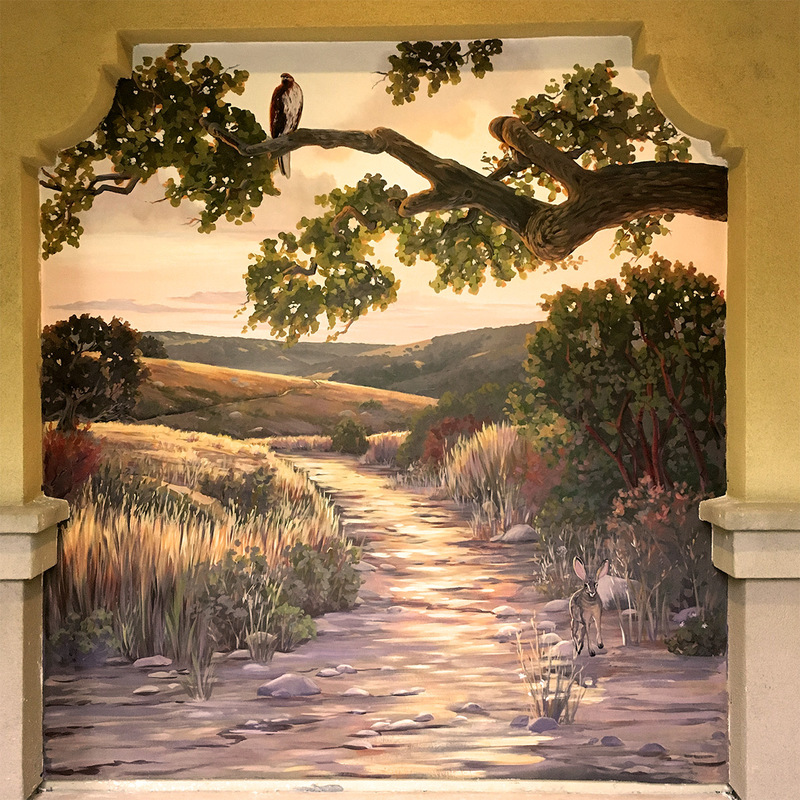 The artwork would transition from time of day – midday to dusk- and also season, spring through fall. 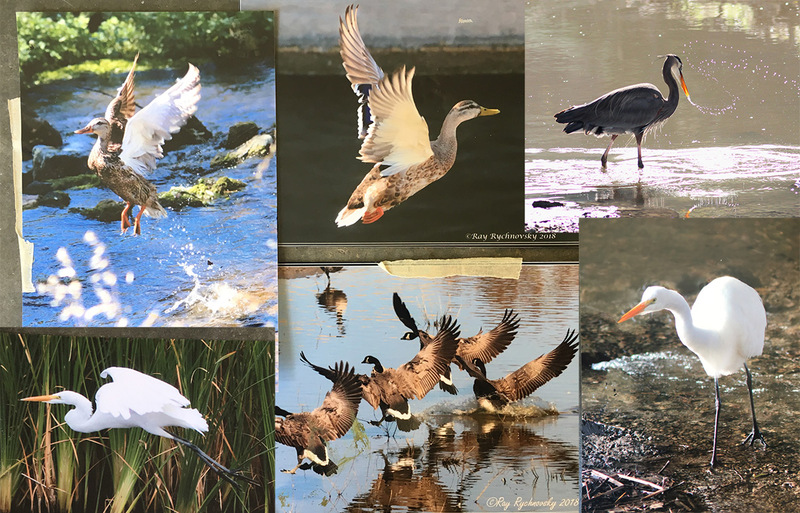 The client introduced me to a resident who was also a talented wildlife photographer. I met up with Ray on my first day on the job, looked through his photos, and saw that incorporating wildlife images would greatly improve upon my initial concept. I always want my work to be as meaningful and relevant as possible to those who will enjoy the artwork every day. 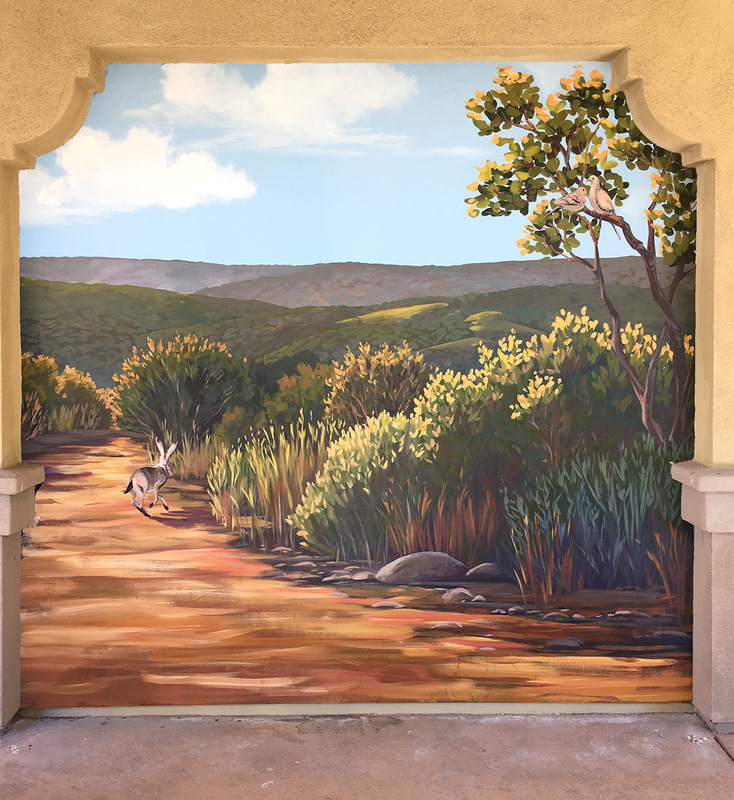 In this case, collaborating with a well-known creative at Stoneridge Creek made the project truly community based. Ray gives talks and exhibitions of his work for the community, sends out photo journal emails, and produces an annual wildlife calendar. Hanging out with the “coolest kid” on campus also helped me gain early acceptance with the Stoneridge Creek community. There used to be a beloved fox family on campus until they started getting into trashes and became a nuisance. 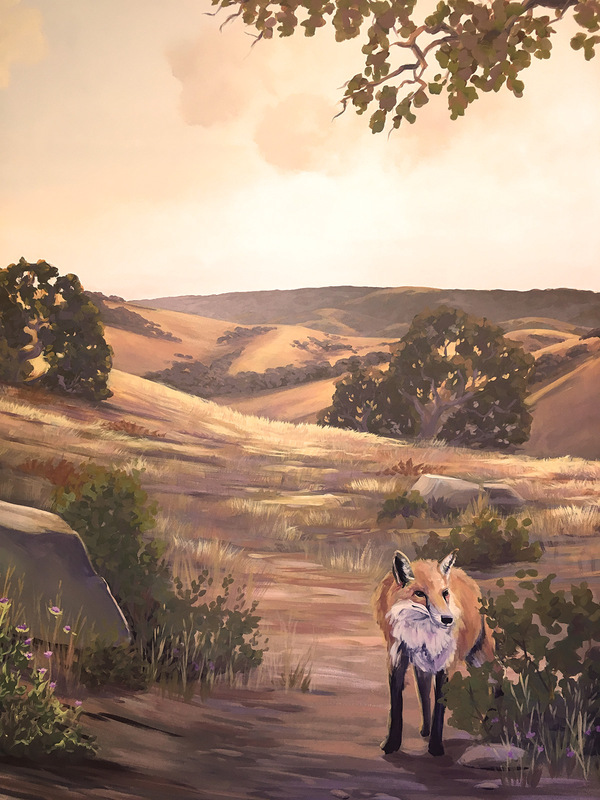 Opinions varied as to the fate of the foxes, but everyone recognized the fox in the mural. 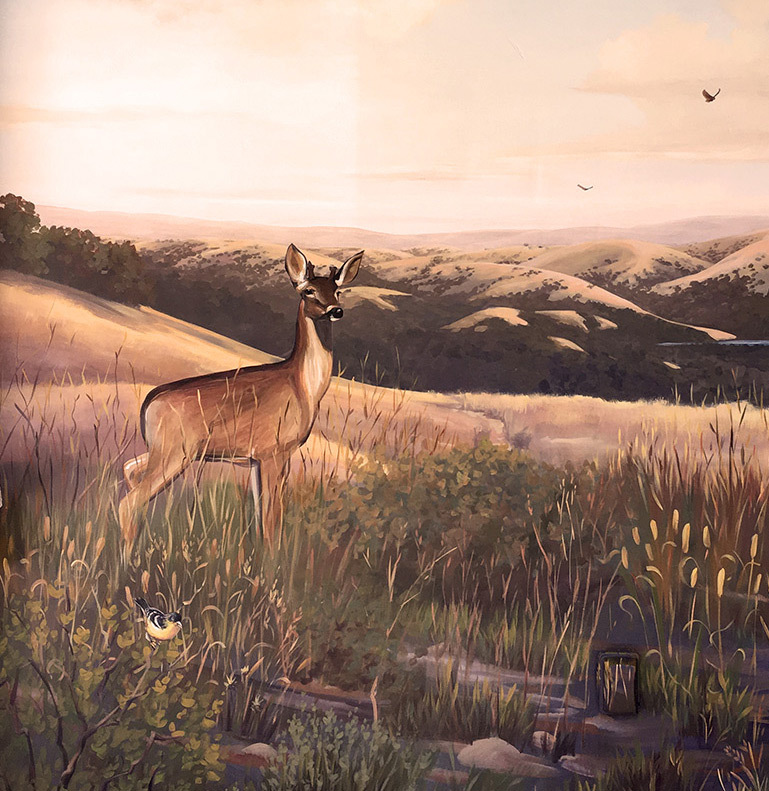 I also received the feedback that for both the fox and the deer, their eyes followed them – and for some the heads even turned slightly- as they walked by. 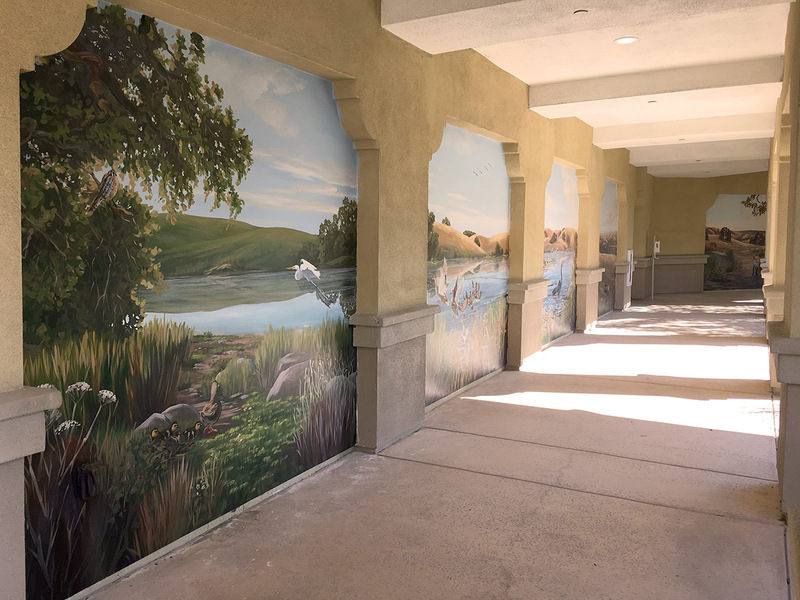 Residents from the far side of campus would stop by the artwork to determine for themselves whether the wildlife turned their heads to watch them as they walked by. My fluid creative process helps ensure that my art is site-specific. 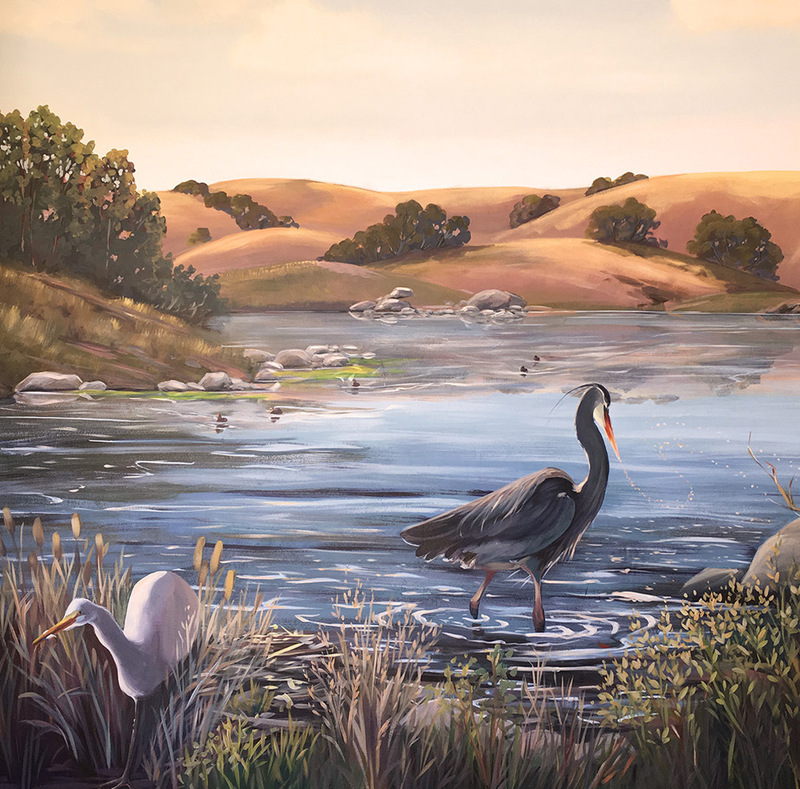 I let inspiration from the immediate environment, everything from overhead cloud patterns and season, to daily interactions with people I meet, influence the content and tone of the artwork. Let’s hope I am not in a bad mood when I go to work. I might put a predator and their prey in the same panel. On this day, all the animals were safe. 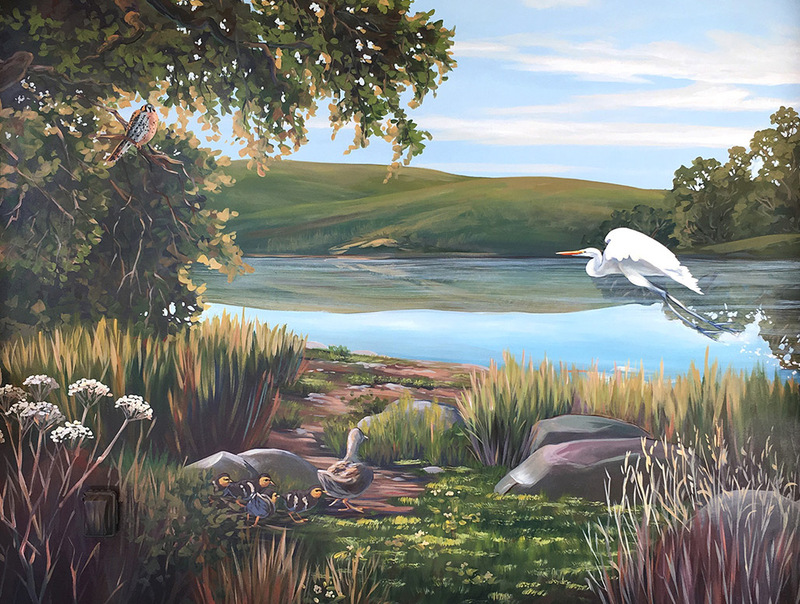 The wildlife based on Ray’s photos are a primary feature in each mural. Ray has an abundance of great waterfowl shots because of the creek that runs adjacent to the develpment. Ray and I took a walk to see his favorite spots to photograph, and he loaned me an extra pair of binoculars for the excursion. 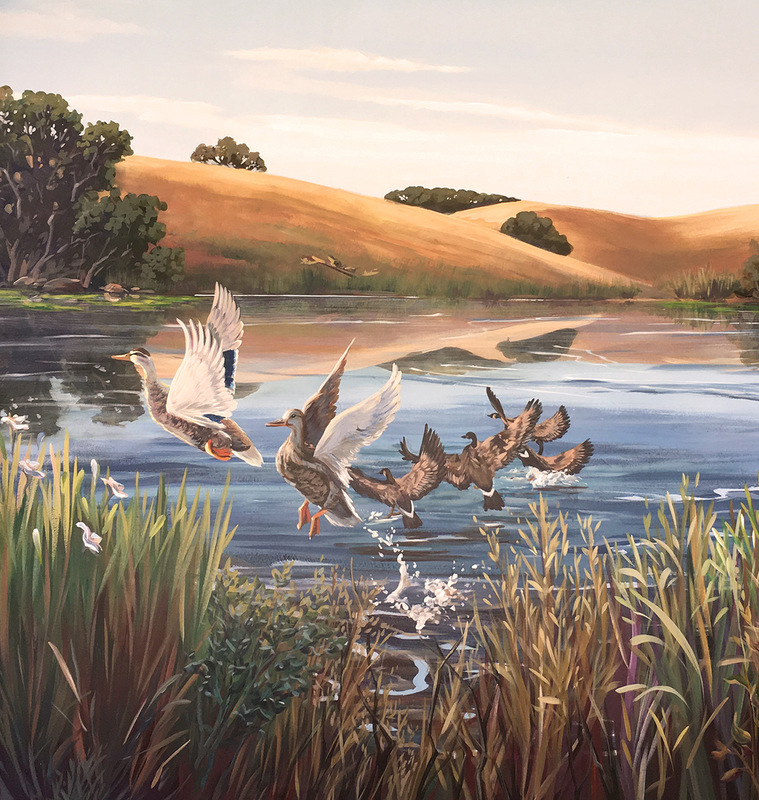 The level of detail I could see was a revelation; the individual bird feathers, the details in the colors of each reed along the shore. I now keep a pair of binoculars in my glove box. Duh. I’m still learning how to see better, both literally and figuratively. Can you spot where each of Rays photos show up in the murals? While working at Stoneridge Creek I felt like I had a couple hundred sets of grandparents encouraging me along. At first, a few residents expressed concern about the cost of the project, or the strong colors I used for the base coat. By the end of the project, I didn’t hear those concerns but did notice the arcade had become a popular destination to take visiting family members. An easy hike with great views: what could be better? 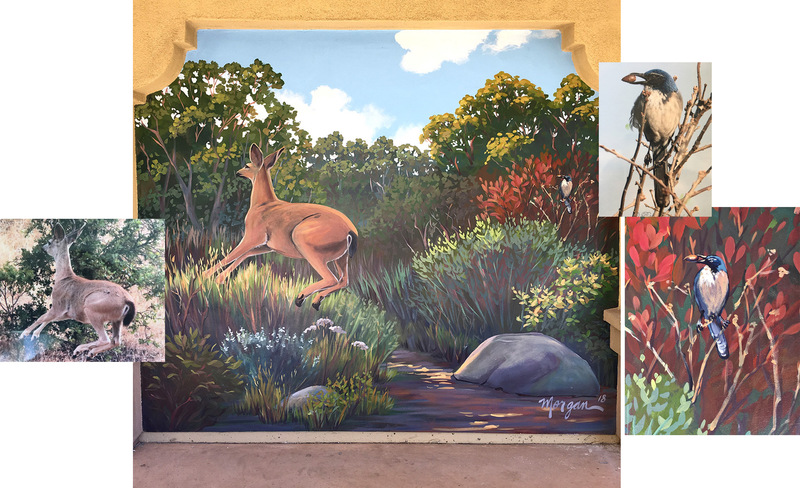 I love to create artwork that celebrates the wildness that is outside our back fences, and just beyond our freeways. Thank you for walking this leg of the journey with me.